The situation is rapidly developing in the Damascus suburb of Eastern Ghouta where the Syrian Arab Army (SAA) and its allies are on the verge of liberating the entire area from militants. 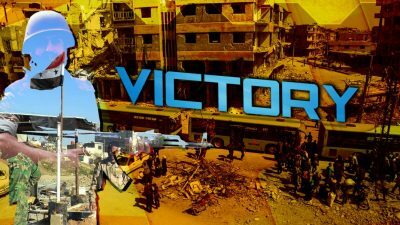 Following the evacuation agreement in Harasta, government forces have liberated Ayn Tarma and have forced militants in Jobar, Zamalka, Hazeh and Irbin to accept another evacuation agreement. The implementation of this agreement started on March 24. More than 7,000 civilians and members of Hayat Tahrir al-Sham and Faylaq al-Rahman are set to leave the area under the deal. Separately, negotiations are ongoing in the area of Douma controlled by Jaish al-Islam. According to pro-government experts, the key issue preventing the group from accepting the deal is that its leadership seeks to prevent the evacuation to the militant-held area of Idlib, mostly controlled by its competitors, like Hayat Tahrir al-Sham. According to some reports, the group is willing to be evacuated to Eastern Qalamoun area. In any case, the SAA has de-facto won the battle for Eastern Ghouta. Gaining a full control over the area is just the matter of time. On March 24, the General Staff of the Turkish Armed Forces (TAF) released a statement claiming that the Afrin area is under “complete” control of Tukey-led force and efforts to help civilians return their homes securely are underway. Chief of General Staff Gen. Hulusi Akar announced that there are still few villages, which Turkey seeks to capture south of the city of Afrin. “There are 3-5 villages left in the west. We will arrive in the suburb of Aleppo called Nubl-Zahra and Afrin will be completely secured soon,” Akar said at a conference in the capital Ankara. On the same day, units of Syrian government forces, mostly members of the National Defense Forces (NDF), deployed in the villages of Bashmra, Zoq al-Kabir, Buurj al-Qas. Miyasa, Aqiba and Ziyara as well as the nearby high points south of the city of Afrin. The deployment was aimed at preventing further advances by the TAF and its proxies. Turkish forces captured the city of Afrin from the Kurdish People’s Protection Units (YPG) on March 18. Since then, the TAF and the Free Syrian Army (FSA) have made a series of limited advances south of the city expanding a buffer zone between the Turkish-occupied area and the government-held countryside of Aleppo. On March 25, Turkish President Recep Tayyip Erdogan claimed that 3,747 so-called “terrorists” had been neutralized since the start of Operation Olive Branch in Afrin. The presided said that 302 members of FSA died during the same period. Erdogan also vowed that Turksih forces will capture Tal Rifaat before ending the operation. The advance on Tal Rifaat may trigger a confrontation between Turkish forces and the Syrian government because a number of NDF units have established checkpoints near the city under an agreement with the YPG.